Happy Day! Freebie and my AWESOME NEWS! Back the Spring, Becky Higgins contacted me to create a collection for her, and to say I was excited would be the understatement of the century! They asked me to design something for them that represented me and my own personal style, and gave me a lot of freedom to come up with a concept and colors and everything! I worked very hard on this collection, and I am seriously so proud of my work. Designing for the paper industry has been a long LONG time dream of mine, and I am such a huge project life and Becky Higgins fan! I have to say, this could not have been a more amazing and fulfilling experience for me, and now that it has finally been announced I am seriously floating. This set of 6 cards comes in both horizontal and vertical orientations – and includes a simple to print PDF sheet for all you non-photoshop users out there! These are FREE for you, just click the preview image to download! For all of you that have been following me as a designer and as a person all of these years, from the bottom of my heart, thank you! For nine years I have been designing digitally, and this has always been in the back of my mind as a HUGE goal, I could not be more thrilled to officially announce that I did it, and I can’t tell you how much it means to me that I’ve had you along for the ride! 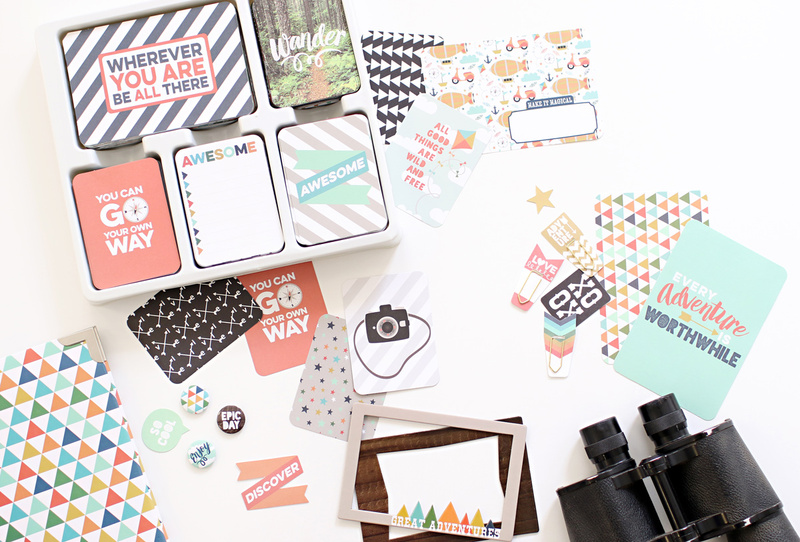 If you are looking for the Explore Edition, you will soon be able to purchase it at Becky Higgins‘ web site, and it is popping up at other online retailers – Scrapbook.com is carrying it but the core kit is out of stock as of now (that’s good news right??? ), I am HOPING to see it in person at a local retailer, and you had better bet that as soon as I do I’ll be instagramming a photo of myself next to it like as soon as I can! I’m also REALLY looking forward to getting started on my Explore album, I’ve been waiting for this puppy to come out so that I can use it for my 2015 Album! Whee! Ok well I must go start my mom-stuff around here for the eve. Enjoy your freebie!! I’ll be back later this week to show off some more photos as soon as the sunshine comes out, and until then, have a happy happy day my friends! Such a fun happy style…thank you!